A few months ago I came into work to see a news story left on my desk. It was inconspicuous, a small sheet of thin paper roughly torn out of a little pamphlet, and it told me they The Little Prince was coming back. The little golden-haired boy whose story opened my eyes to a whole new way of thinking had touched another author enough to be brought back to life. Then, one evening this October as the weather was just starting to turn, I was walking out from South Kensington tube station when I passed small, independent book shop, lit up against the coming dark with the most wonderful display of hardback books – he had arrived. Those of you who have read my blog a lot might know of my love affair with The Little Prince. I love French translations, and this one was so wonderfully magical and childish that it took me back to innocent place in the very far reaches on my memory. The golden-haired boy of Exupery’s tale holds a firm spot in my heart, and the idea of seeing him again filled me with so much joy. I approached the book with a certain amount of caution, aware that it could so easily fall short of my rather high expectations – The Little Prince is a rather hard act to follow. I’m not going to pretend I didn’t have a few reservations while I was reading the book – there were the invariable comparisons to the original – but while I found it difficult at first after some time I realised that the book needed to be different. After all the original book is not just the story of The Little Prince himself, it is the story of the Aviator – that is, Antoine de Saint-Exupéry – and how his life was touched by The Little Prince. In the same way, The Return of the Young Prince is a tale of how The Little Prince touched A.G. Roemmers. In The Return of the Young Prince, a solo driver, setting out on an expedition across the mystical land of Patagonia, finds a young, starving teenager asleep at the side of the road – none other than The Little Prince, now grown, who has returned to earth in search of his friend the Aviator. The pair embark upon a journey of a lifetime, the man with a destination in mind, and The Young Prince, as he is now known, hoping that along the way he will find what he is looking for. The Young Prince and the driver speak, they are philosophical, quizzical, educational and at times humorous, the conversations passing between the pair serving to highlight, as in the original, the wonderful difference between the adult and juvenile brain, and that there are things in life that you cannot put a price on. There is so much I could say about this book, so many anecdotes I would love to pick apart and ponder over the hidden metaphors and morals. There are so many messages one could take from the story, though, that it would be unfair of me to do so and to taint your own experience of the book. Assuming of course that you are willing to give the book the time of day – I thoroughly recommend it. It’s important to approach the book with an open mind. Do I prefer it to the original? Of course not. It’s a very different book, but while it changes some of the themes of the original, it does not detract from Antoine de Saint-Exupéry’s work. This is a book which speaks of how The Little Prince touched the life of the author, a man who has dedicated years of his life into researching and studying Antoine de Saint-Exupéry. The book does not try to pick up where Antoine de Saint-Exupéry left off. Rather, just like The Little Prince, it serves as a tale told by a man whose life was changed by his encounter with the golden-haired child of Antoine de Saint-Exupéry’s past. First published in 1943 this sweet little novella is the most famous work of Antoine De Saint-Exupéry, and has been translated more time than any other book in the French language. This is another book I found nestled cosily amongst our bookcases one evening. It’s a tiny little thing so I decided to spend the evening getting to know the Little Prince hidden within it’s pages a bit better. The Little Prince seems at first to be written for children, but there is a very obvious philosophical message behind the story. I feel that on this level the story has appeal to both children and adults, anyone sat reading this book with a child on their knee is sure to enjoy it just as much as the little one. 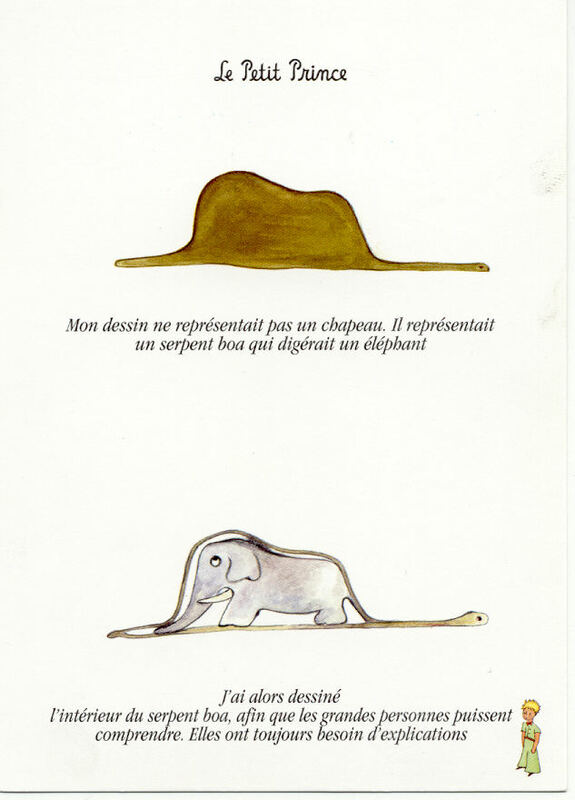 Saint-Exupéry tells the story of a very thoughtful chap, who as a child learned only to draw boa constrictors from the inside and outside, and was terribly upset to find no one else fully appreciates his artwork. As an adult the voice of the story becomes stranded in the desert, and makes an unlikely friend. Someone who finally understands his drawings of so long ago – ‘the Little Prince’. This charming little story traces the tale the Little Prince has to tell, of his travels across the universe, before finding his way to earth, and to our humble narrator. 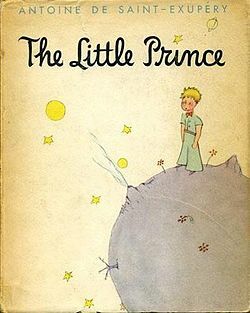 The Little Prince visits many planets on his travels, mainly inhabited by a single person. Each character is more ‘odd’ than the last in the eyes of the Little Prince. A king – Obsessed with giving orders, A businessman – obsessed with money, A drunk – obsessed with drink and his own misery. The Little Prince continues on his travels, never fully understanding the people he has met along the way. Behind Saint-Exupéry’s dear little story, there is an allegory of the human condition. The inhabitants of these planets are so preoccupied with the things that seem so strange to this innocent little mind. Not one of the people the Little Prince encounters is able to make a valid argument for the importance of his work. While the Little Prince cares only for doing what makes him happy, about asking questions, and caring for his possessions back on his own planet, including the love of his life -a beautiful rose. Overall I found The Little Prince to be quite a satisfying read. It’s a short book, and can easily be enjoyed all in one go; in fact I found that once I started to read it I didn’t want to stop until it was finished. The book appeals to me on a many levels, I think it is a lovely little story for children ― I also think a fair few adults will enjoy the story for what it is ― but I also really enjoyed the allegorical side of the tale.